MRP is an inventory control system vital for running a successful business. 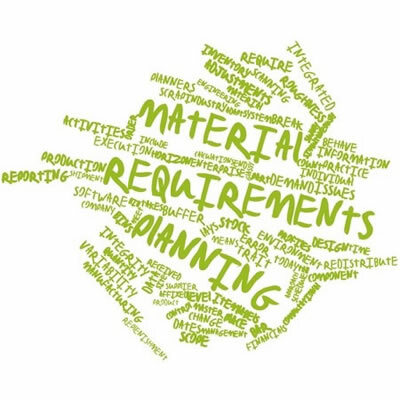 What is Materials Requirement Planning? Materials Requirements Planning, or MRP, represents a production planning and inventory control system used to manage a manufacturing process. It is a software application that replaces previous spreadsheets before electronic software systems became more commonplace. However, many companies continue to conduct MRP by hand, particular small startup companies or contract manufacturers that help entrepreneur start-ups. In fact, a contract manufacturer may not input your ingredient data and recipe until repetitive production runs have been established. Why Use An MRP System? What items are required to conduct the production run today (based on recipe or formulation)? How many items will be required (based on recipe or formulation)? When will those items at predetermined levels be required? How Does MRP Differ From ERP Or Enterprise Resource Planning Software Systems? Many people are overwhelmed by ERP systems, but MRP systems are essentially the early forerunner of ERP systems – which have a lot more functionality built into it. An ERP system would have advanced financials, sales order management functionality, and customer relationship management. Should MRP Software Functionality Represent An Additional Product Cost? Absolutely not! Once a contract manufacturer purchases the software, it should not represent an additional cost because the inventory management benefits far outweigh the cost of the software to the contract manufacturer owner. But at times, the contract manufacturer will itemize this as a shared cost. What Is a Reverse Bill of Materials (BOM)? When talking with your contract manufacturer about his/her MRP system, the term “Reverse Bill of Materials” may surface – especially when processing produce, grains, meat and poultry products. Reverse BOM is the process of taking a single product and breaking it down into its individual parts, then taking these components into stock as separate – and saleable – products. This process is largely unique only to the food industry. What Value Will This Add to My Company? Whether you are a fledging entrepreneur, or an established food company, I highly recommend selecting a contract manufacturer that uses an MRP system. It will provide an accurate accounting of the inventory used during production and reconcile usage with new product manufacturer – and prevents over ordering of ingredients for the next production run.